Infographic by the University of San Francisco’s Masters of Public Administration program. The tsunami in Japan; the earthquake in Haiti; Hurricane Sandy in the United-States. These disasters, and many more like them, have in the past few years illustrated the wide applicability of social media in disaster response. Due to its broad reach and ‘un-wired’ nature, social media has become a go-to tool in emergency situations and natural disasters. Twitter, Facebook and other social networks have been used for everything from fundraising to reaching people who are trapped, from communicating with rescue workers and the power company to letting family members know that their loved ones are safe and sound. Social media has helped people in ways traditional resources couldn’t. 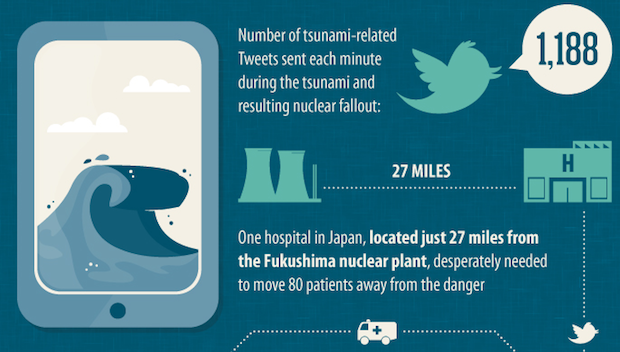 Social Media in Disaster Response Infographic by the University of San Francisco. Let HootSuite help you with your emergency response plan. Try it today.